So, how important is the ideal time to eat your meal? We say, what we eat is important. Eating healthy and nutritious foods can help in weight loss and disease free life, to a great extent. But, how far does eating in right time adds to the healthy lifestyle? Well, eating your meals in time is as important as eating healthy foods. In fact, eating healthy and timely, is best for good healthy and prosperity. Ideal time to eat your meals is the best way to put your body into healthy eating. It not only curbs your hunger but also boost your metabolism, attaining results in weight loss and healthy diet plans. 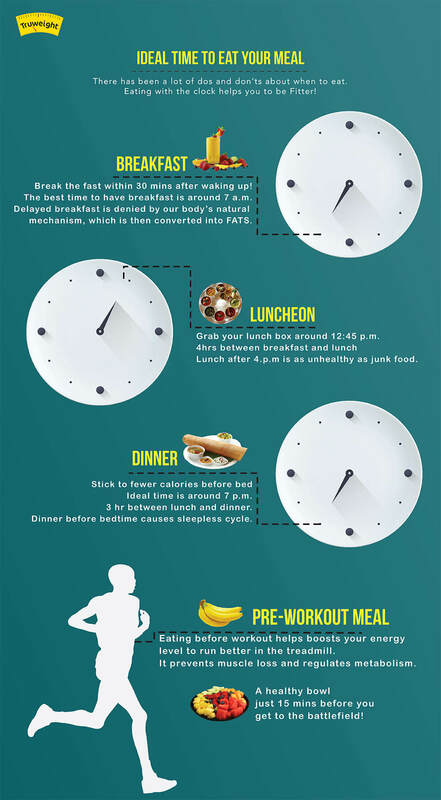 According to the research, maintaining a stipulated time between your meals and eating with the clock can set your metabolic rates to maximum, which keeps fat accumulation at bay. Now, eat in right time along with eating right food! Healthiest Fats: Extra Virgin Olive Oil!